Beautiful World is a new series at Happy Mummy; each week we will interview a Top Blogger and talk all things Travel. This week we have the pleasure of talking to Jade from Mummies Waiting. Don’t miss Jade’s tip below about how to get cheaper Eurostar upgrades! As I’m writing this its the middle of July and I’m currently listening to the Pogues Fairytale of New York because, yes I love Christmas THAT much! I’m also mad about Disney and have a passion for holidays and home educating our children because life is all about adventure! I love Great Yarmouth because it’s my home town and there is so much to do there. In the summer its bustling and in the winter it feels all cosy. Lapland UK and the Polar Express! I haven’t done either but they both look AMAZING! The plan is to try and do one of them this year. This has to be Disney, it’s been almost 10 years since I last stepped foot in Walt Disney World, but having been to Disneyland Paris a lot in the past 5 months, Disney is still winning! I have a few and I honestly can’t decide for different reasons. I want to visit Lapland because I am SURE it will be extremely magical and amazing. I’d love to visit Disneyland California and see Walt’s home and all the magic it has. Lastly I would love to take a trip to see the Northern Lights, something completely different but still totally magical. 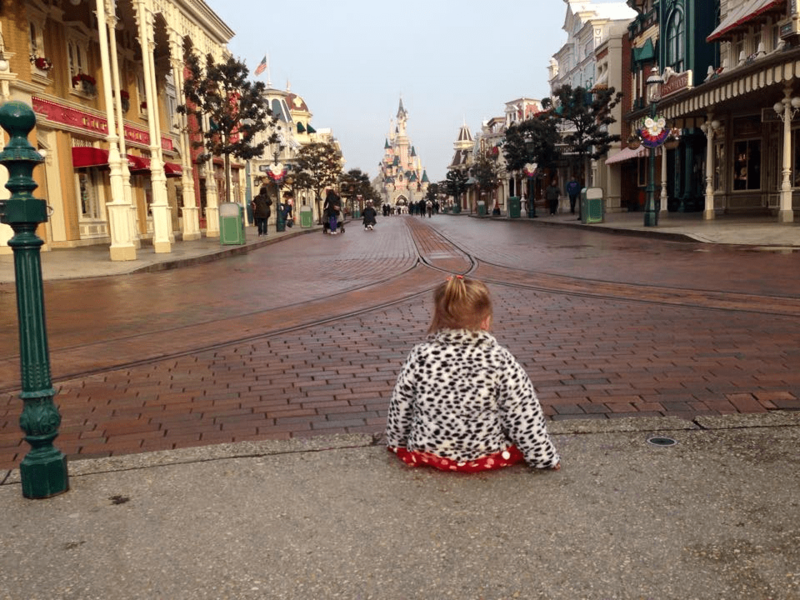 The first time Kairi saw the castle at Disneyland Paris. She just sat there and took it all in, it was a quiet early morning and she was amazed. It was such a beautiful moment, I just grabbed my phone, held the shutter button down and hoped that I had got a great shot. I absolutely love it. I can’t stand the beach, sand is yucky! However I’m, not really city and shopping kind of girl. So a beach holiday where I can just stay somewhere all inclusive will work. Okay, lets assume its not Disney or Christmas related for a moment! I would love a 4*/5*/5*+ all inclusive, warm pools, hot sun but plenty of shade. A great drink menu and plenty of Al-la-carte. Choritzo on the breakfast menu! A really good animation programme, friendly reps and plenty to do. I’d like the area to have things to do near by and good trips so we can go off site if we wish to. Oh and great music with party dances. We are off to Hopton Holiday Park in October to stay in a static caravan for the weekend and we are looking at Camping in our tent at the Wild Duck in September. The Disney in December! Shop around, be cheeky and always ask for more. If you don’t ask, you don’t get. When we asked how much it was to get our Eurostar tickets upgraded we were surprised that it was cheaper than stated online; we would never have known that if we hadn’t asked! When we were younger we would make so many friends. We still have a few friends in America who were fantastic and I would love to see again. Christmas songs! It just HAS to be! Great idea for a series. I would LOVE to go see the northern lights. This is a fantastic post, and a great idea for a series! 🙂 I love how Disney & Christmas obsessed she is! 100% agree Disney holidays are the best. Ive not been for 10 years either but currently saving and planning to go with our kids in a year or two. Your description of 5* all inclusive holiday gaff mgs day dreaming, we always make sure it’s all inclusive holidays we go on. Makes life so much more relaxing when you’re there.